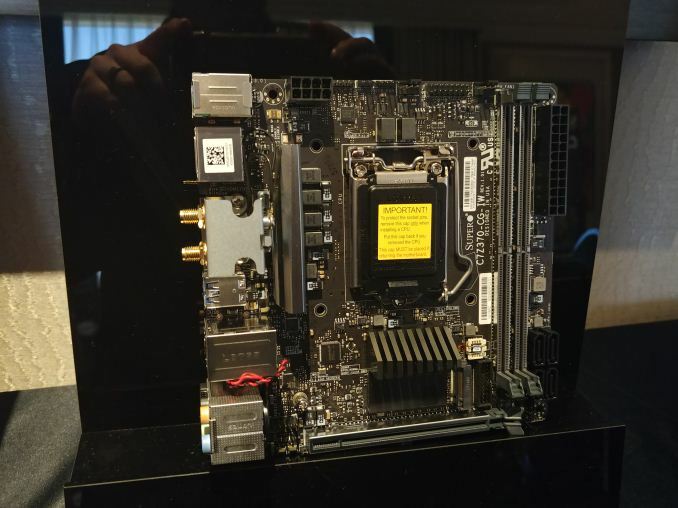 A few elements to Supermicro’s suite at CES were intriguing, one of which was the company’s first foray into a consumer mini-ITX motherboard. The C7Z370-CG-IW, based on Z370 and Intel’s 8th Generation Coffee Lake processors, is going up against several motherboard vendors with immense experience in this area, but Supermicro believes that it can add something different to the market. 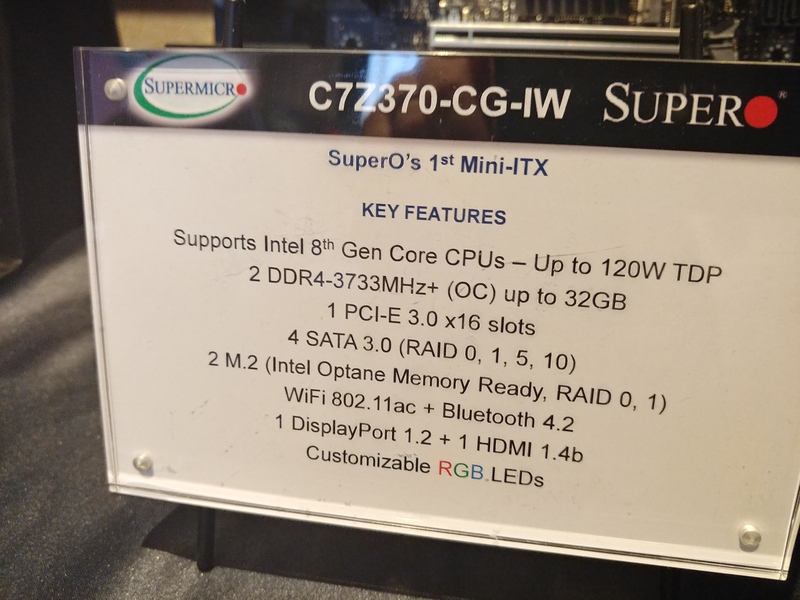 Supermicro’s consumer, gaming focused brand is called ‘Supero’/’SuperO’, and the idea is that they are using the expertise from designing so many custom server systems over the years that the experience can translate into the consumer market. Supermicro is a big company, and so the company has put forward a few products for each major chipset the last few years. It has a couple of Z370 products out in the market, and this C7Z370-CG-IW is its first proper attempt at mini-ITX. Of course, the name doesn’t win awards: ‘C7’ is what is put on all the consumer boards, ‘CG’ is for consumer gaming, and ‘IW’ isn’t specified, but likely to mean ‘ITX-something’. Normally with motherboards from companies with a server focus, one of the overriding visual feelings is that the boards are sparse with features, given that server boards are often built for specific machines rather than a general PC that could have any number of components. 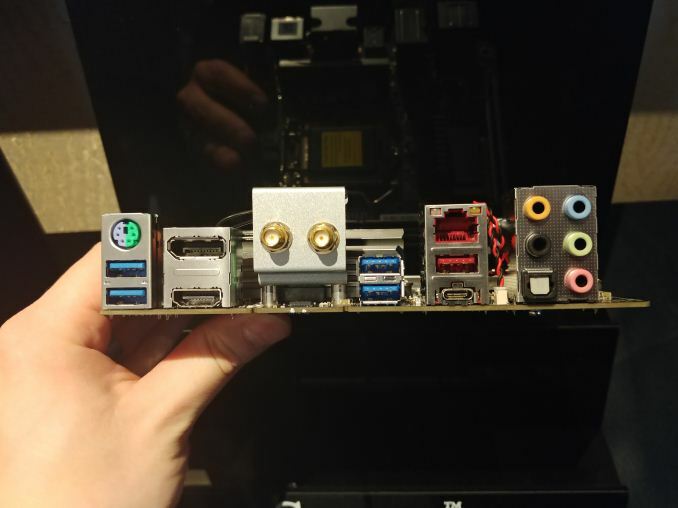 On something as small as a mini-ITX board however, there is little room, and the visual look of this board means it doesn’t stand out of the crowd like some OEM motherboards do. 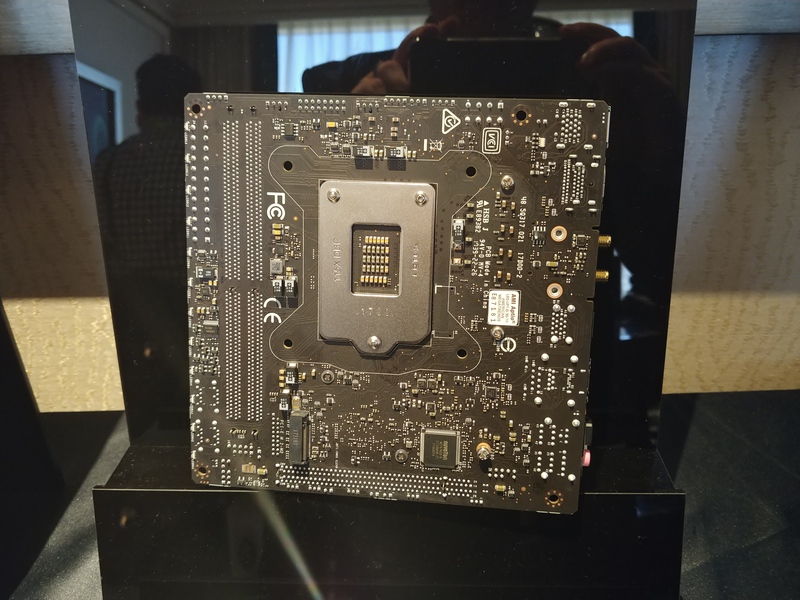 The product manager for this board stated that it is using server grade power delivery (with what looks like a 4+2 or 5+1 arrangement), and features like reinforced DRAM and PCIe slots were a must when the board was designed. One thing that struck me is that SM has not fallen into the trap where some of the major consumer motherboard manufacturers did in their early mITX offerings: the 8-pin power is on the edge of the board which is good, the SATA ports are also on the edge, and not tucked in behind the DRAM, and the Wi-Fi chipset does not have cables winding around the board to the rear panel. Overall, this is (on visual inspection), already an interesting offering. 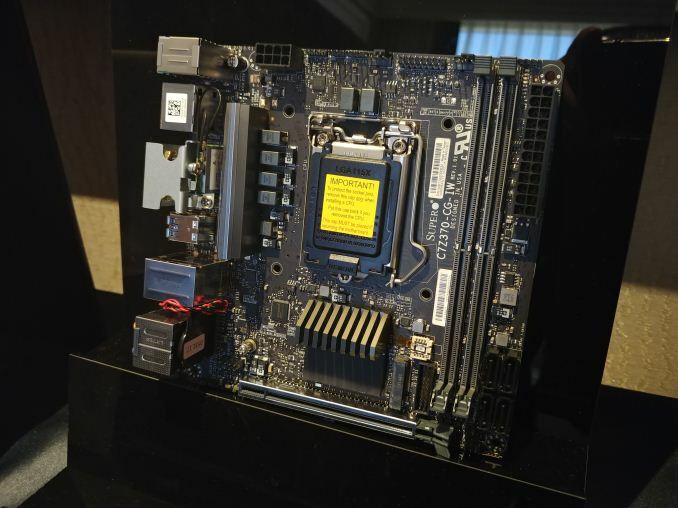 To add in the mix, SM also has two M.2 slots: one just above the PCIe that can take advantage of the chipset heatsink, and another slot on the rear of the board. The C7Z370-IW-CG is rated to take CPUs up to 120W (which covers the i7-8700K at a high all-core turbo), memory up to DDR4-3733 (which is high for a mini-ITX), and bundles dual video outputs, USB 3.1 (10 Gbps) ports, and Intel Ethernet along with the 802.11ac Wi-Fi card. There’s also the Realtek ALC1220 audio codec, and customizable RGB LEDs on board with an RGB header. If there is a criticism on a first look, it is that the front panel header is right by the PCIe latch, and large GPUs will not like the standard paired cables that go with front panel switches. The audio codec front panel header is also awkwardly positioned for any GPU that has a back-plate. Ultimately it looks like mini-ITX focused GPUs would fit in quite well here, though some of the bigger standard GPUs might make things difficult if SM hasn’t bundled in an easier way to connect these cables. We were told to expect this motherboard to be on sale shortly. You don't want to rely on NICs attached to a PCI-e bus on any kind of pfSense or router box. The fact of the matter is that the ASICs developed for enterprise grade switches has lower latency (no PCI-e bus overhead) and faster switching. It realistically does not make sense to purchase 7x 4 GbE NIC cards and slot them in a 7 PCI-e slot board to use a general purpose PC like a 28-port GbE switch, especially when switching speed between NIC cards incurs a PCI-e bus penalty and the overall system consumes much more power and noise.